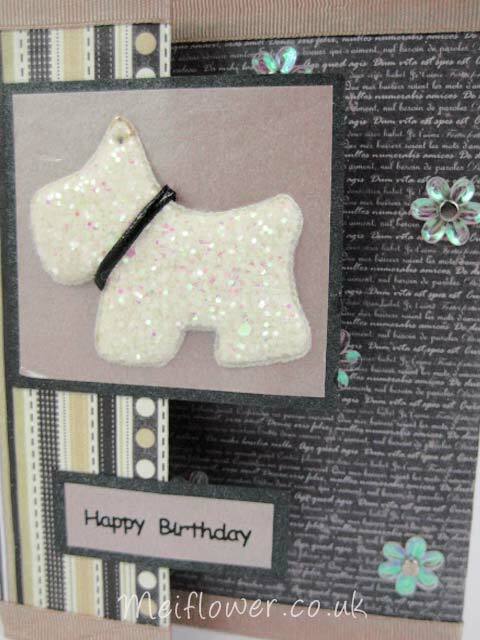 This is a lovely doggy card i made for Create and Craft shopping channel using the doggy kit. It was such a big hit on the first show that i put the kit on last month, viewers loved it. I have used a large white square 6 x 6″ card as the base card. 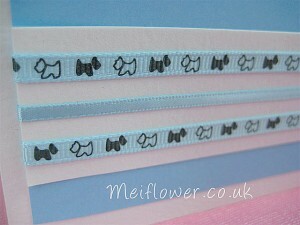 I love using the thin doggy grosgrain ribbon, so i wanted to design something with the same colour scheme. 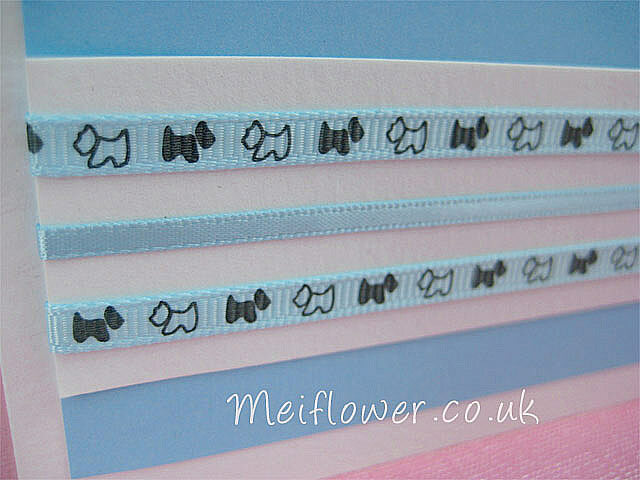 I used white and baby blue paper to match the ribbon. 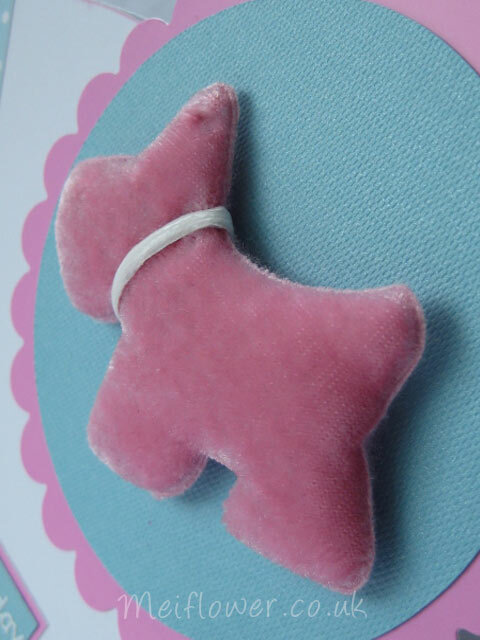 The white glitter dog comes with a faux pink collar, so i changed the collar by swopping and wrapping a thin baby blue satin ribbon to match the colour scheme. 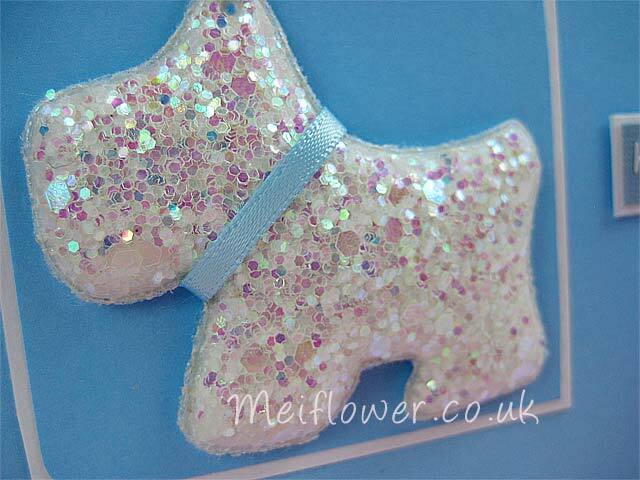 I have matted and layered the glitter fabric dog with baby blue and white paper. Used a corner punch to round off the corners. 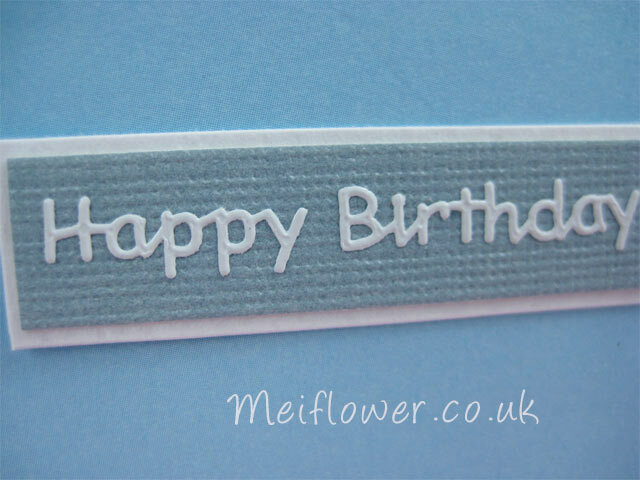 I have matted and layered blue bazzil and white card for the white ‘Happy Birthday’ peel off sentiment to finish off the card. Hope all the snow has cleared wherever you are. It is suppose to be snowing again on Thursday and we are expecting a white Christmas. Nice but brrrrrrr fr fr freeeeezing! I am glad i bought a pair of snow boots. 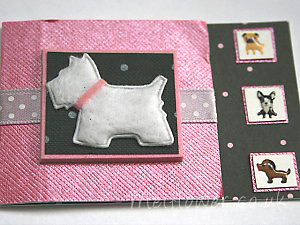 I thought i share this doggy card with you all. I don’t know why but this colour scheme reminds me of winter, like a winter wonderland. I have used a large 6×6″ white square card for the base card. The patterned paper i bought a few years ago from craftwork cards, it is so nice that i only use the paper on special projects. 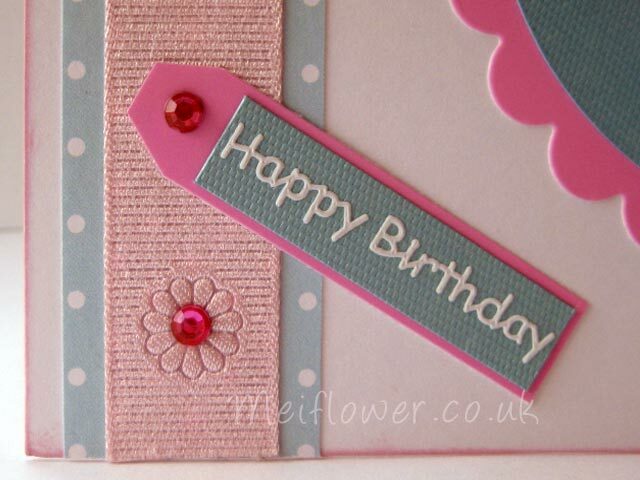 I have chose light pink and light aqua coloured paper to go with the patterned paper. The light aqua paper goes well with the pink glitter dog. 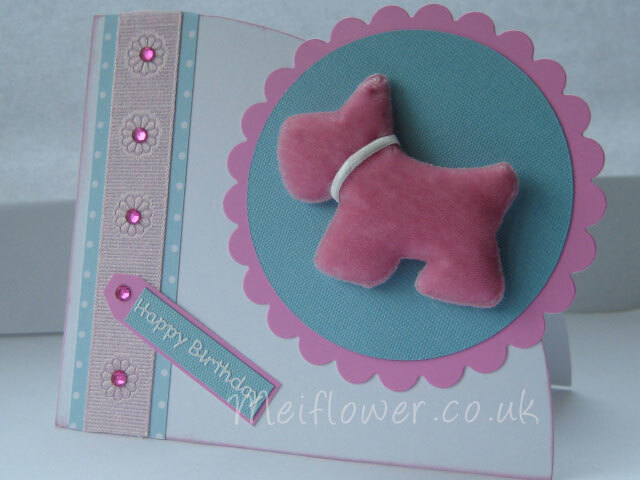 This dog design is ideal for Birthday cards, general greeting card or Christmas card. It is quite a versatile design. 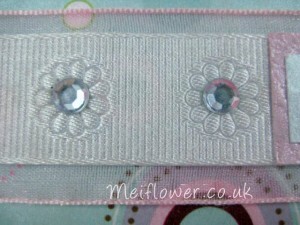 To finish off the design i have layered a wide light pink organza ribon with a white embossed flower grosgrain ribbon. 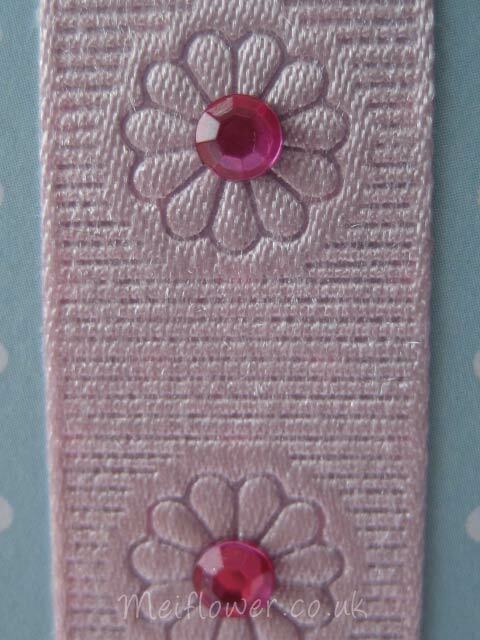 I wanted to bling up the card with gems, so i stuck the gems on the flowery ribbon and on the patterned paper. Just looking at the pile of cards which i need to put on my blog. 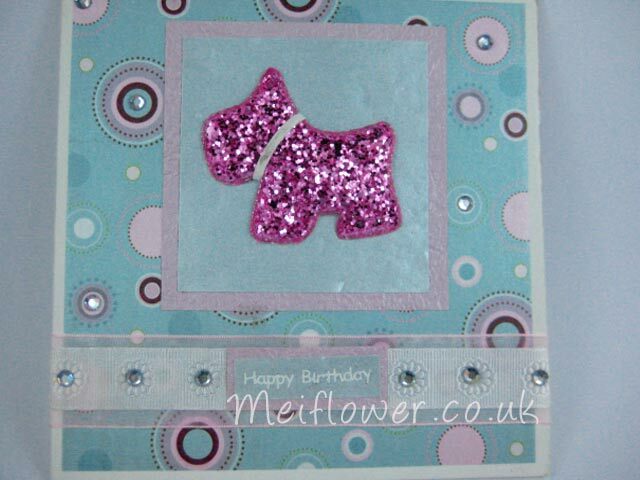 I don’t know about you card makers out there but i never realised how many cards i have made over the years. I have never counted my cards, i have lost count now. The first cards i made make me cringe. 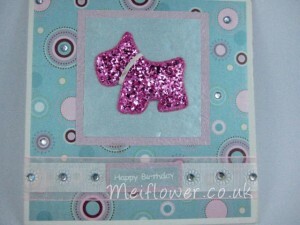 This is one of my favourite cards i have made. It sits on my shelve in my cosy craft room. The paper i have used for this card design is from Craftwork cards. Not sure if they still sell this, i bought this paper a while ago. I keep alot of pretty papers for special occasions. I have attached irridescent sequin flowers onto the black printed paper with silver brads to match the glittery dog. 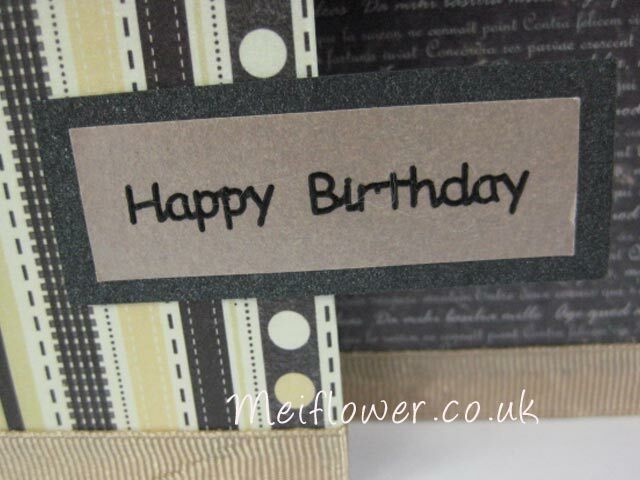 The patterned paper is gorgeous, i really wanted to make a sophisticated card. 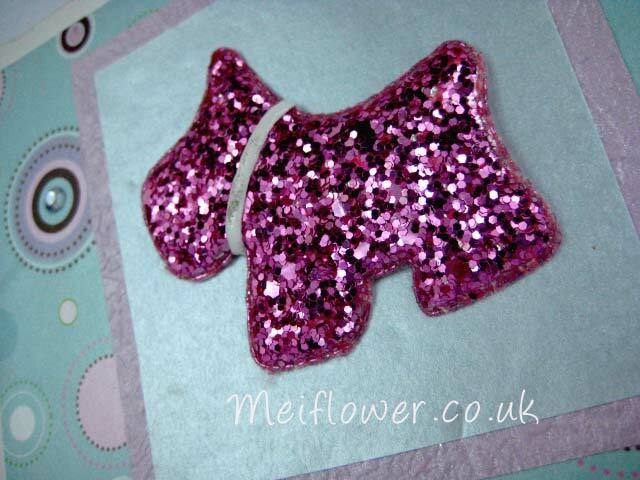 The paper goes really well with the glittery dog. 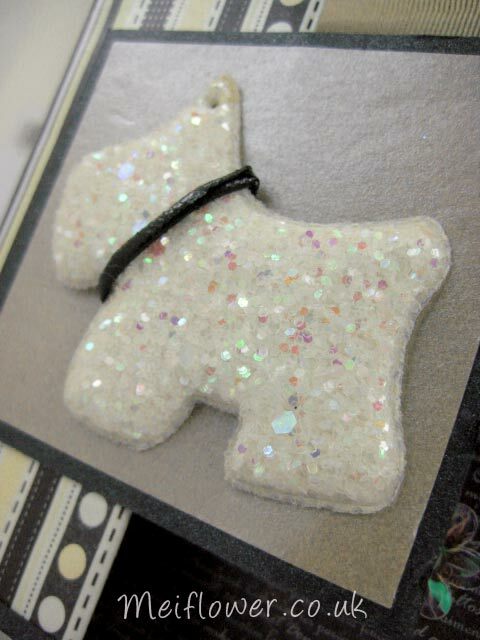 I have mounted the glitter dog on a light biege card. 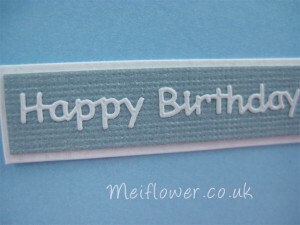 To finish off the card, i have stuck light biege grosgrain ribbon on top and bottom edge of card. I was making a birthday card using white scottie dogs when i thought you know what, the cute doggies would look really cool on a ATC, so i put the birthday card to one side and started on the ATC. Tried to use just one sided ATC but as usual i was running out of space for my design. Lol! 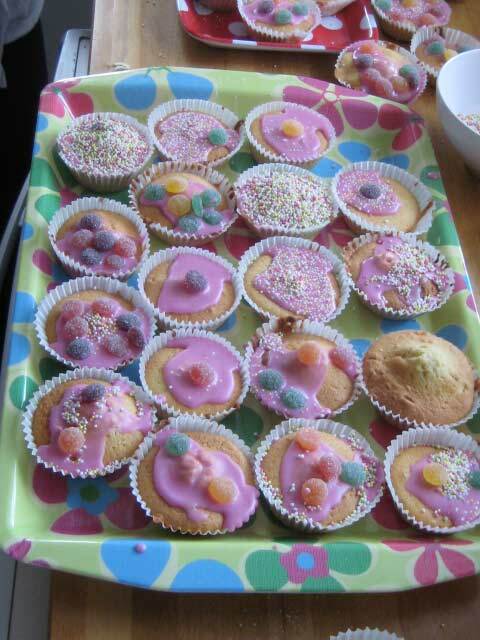 Had the colour scheme in mind and yes it does involve pink. Used these little doggy stickers to go with the design. 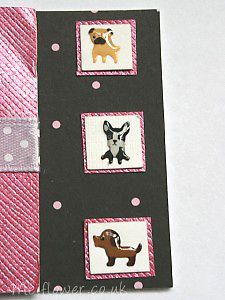 I like using them on cards or ATC’s, they are so cute and adorble. To make small stickers look bigger, matt and layer in a square in the shapeand style to suit the ATC or greeting card. The scottie dogs are so cute, nice furry texture. Hope you dog lovers out there like the card. 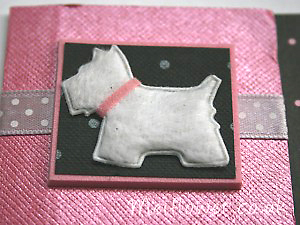 The Scottie dog is mounted onto black and white polka dot paper and onto pink funk foam. 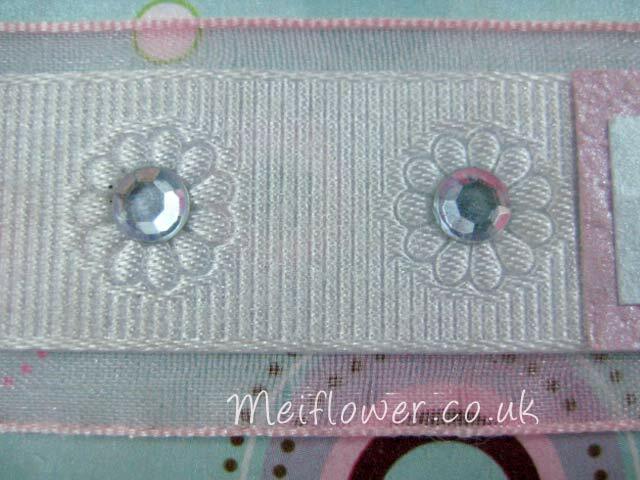 Its embellished with some polka dot ribbon.